WoW! World of Warcraft’s second expansion Wrath of the Lich King is officially the fastest-selling PC game in history, breaking the last record, set by WoW’s first expansion Burning Crusade, by nearly half a million.Wrath of the Lich King launched pretty much worldwide over a four day period, but in the first 24 hours alone it sold more than 2.8 million copies, toppling the Burning Crusade’s record of 2.4 million in the same time period. "We're grateful for the incredible support that players around the world have continued to show for World of Warcraft," said Mike Morhaime, CEO and cofounder of Blizzard Entertainment. "Wrath of the Lich King contains some of the best content we've created for the game so far, and we look forward to seeing even more players log in to experience it in the days ahead." While new subscription figures aren’t yet available, prior to the expansion pack’s launch, World of Warcraft had already grown to more than 11 million players. 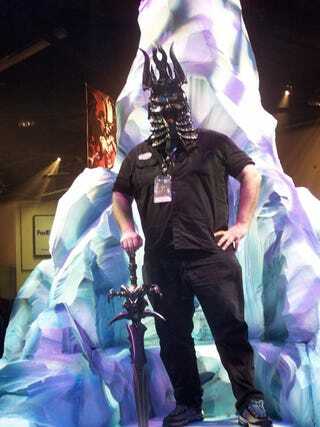 "After a single day of availability, Wrath of the Lich King is already the bestselling PC game of 2008 at GameStop and ranks as one of our top-selling products so far this year," said Bob McKenzie, GameStop's senior vice president of merchandising. "In keeping with the tradition established by their previous releases, Blizzard Entertainment has again created a product that not only reflects their high standards of quality but is clearly an instant hit with gamers around the country."